Dead Ringer – An exhibition of varied media artworks examining identities operating outside of the body, Curated by Leigh Robb at the Perth Institute of Contemporary Arts (PICA) until 27 December 2015. Angelica Mesiti, In the Ear of the Tyrant (still), 2014. Courtesy the artist. The latest exhibition at the Perth Institute of Contemporary Arts (PICA) draws the spectator into the realm of animistic beliefs wherein ghouls lurked in dark corners and under beds. 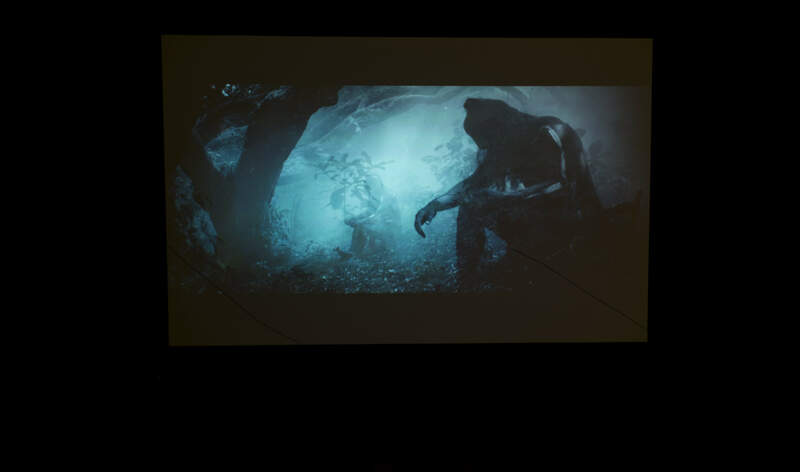 The frontispiece of the Dead Ringer exhibition is a still from Angelica Mesiti’s video installation, ‘In the Ear of the Tyrant’, which takes its inspiration from the Greek myth of Echo. 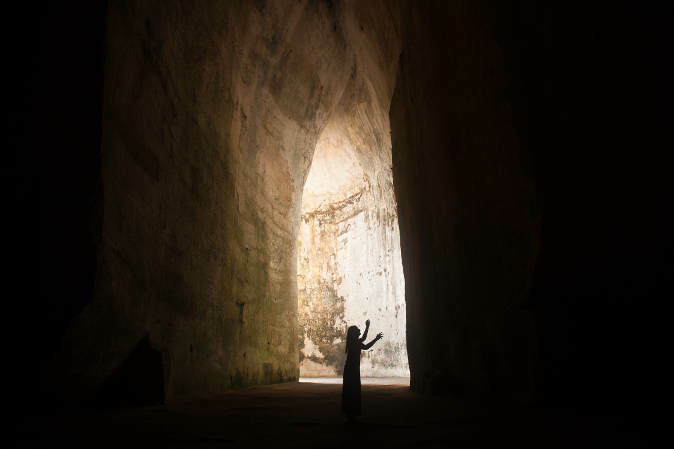 Out of the light, Mesiti performs the Greek mourning moroloja chant for the dead in The Ear of Dionysius cave in Syracuse, Sicily. Setting the tone for the exhibition, her wailing figuration calls to mind the haunting incarnations of the weeping woman in folktales, wandering the liminal space between the living and the dead, keening for lost loves. The eerie, undulating text identifies the silhouette as a dead ringer, one of the many apparitions that now inhabit PICA’s galleries. Opening on 13 November 2015, the exhibition drew approximately 1000 attendees who thronged the Perth Cultural Centre in anticipation of Dead Ringer’s promised horror and fright. As dedicated audiences of the horror film genre would attest, the lure of that which evokes fear is compelling. Why do we set out in search of what frightens us? Curated by Leigh Robb, the unnerving explorations of incorporeal identities in the works of more than twenty local and international artists shown in Dead Ringer offer some insight into this ‘fatal’ attraction. 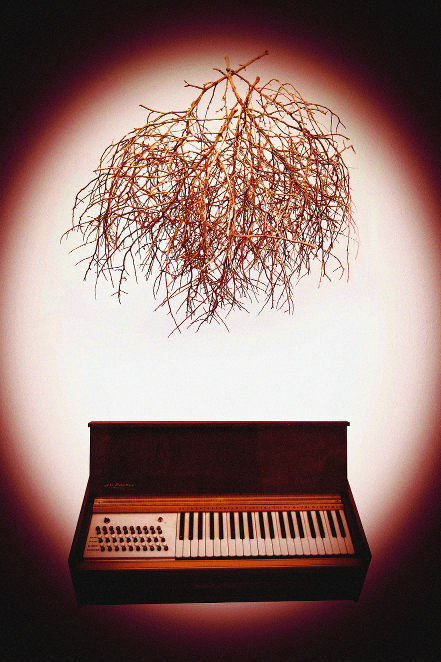 At the gallery’s main entrance, an old chapel organ stands awash in red lighting beneath a suspended tumbleweed sculpture. Subverting connotations of the sacred, Rachel Dease’s installation, ‘Black Mass’, inducts the spectator into a dimly lit space rife with reversals, copies and under-explored taboos. Dease parallels our unravelling during periods of ritualistic mourning to the disintegration of NASA recordings of gravitational wave emissions from black holes on a feedback loop. Her manipulation of what is essentially starlight radiation produced an original musical composition that scores the exhibition. Though effectively inducing feelings of loss, an undeniable pleasure is derived from the indulgence in the simulated sorrow evoked by works such as Dease’s, Mesiti’s, and New Zealand’s artist for the 57th Venice Biennale (2017) Lisa Reihana’s ‘Tai Whetuki – House of Death’ which looks at Māori and Pacific mourning rituals. Lisa Reihana, Tai Whetuki – House of Death, 2014. Dead Ringer (installation view, PICA), 2015. Photo by Alessandro Bianchetti. This pleasure arises from a re-encounter with the sorrow that is otherwise unknowable, repressed within us so as to facilitate our everyday social existence. It harkens back to the formative moment of our individual identities. This moment of loss is associated with what Jacques Lacan described as the (mis)recognition of ourselves in the mirror, which Stuart Ringholt – renowned as one of Australia’s boldest artists with ‘Club Purple’ in Kraft (2014) and his naked tours (2012, 2015) – addresses in ‘Untitled (Brown)’. Rachael Dease, Black Mass, 2015. Photo courtesy the artist. Standing in front of Ringholt’s mirror, the expectation of seeing one’s own reflection is arrested by the sphere of acrylic lacquer obscuring the spectator’s upper body. The disconcertion that ensues is surprising. One struggles to resist the urge to find a recognisable copy of who-I-think-I-am peering back from behind the reflective surface. Ringholt repositions the spectator to consider other bodies and even the wider space reflected in the margins of the work as constitutive of his/her identity, precipitating a confrontation that arouses an inexplicable enjoyment. Here, ‘Untitled (Brown)’ makes manifest – and thus, renders paradoxically less threatening – the anxiety of disconnection experienced in a person’s social individuation. The work reveals a deep-seated desire to see ourselves vis-à-vis the desires of others. It implicitly asks, “Che vuoi?” (“What does the Other desire of me?”) – a question that the subjects in Keg De Souza’s work ask themselves every day. ‘If There’s Something Strange in Your Neighbourhood…Bu dekom’ focuses on a kampung (‘village’) in Indonesia, comprising video footage, a temporary inflatable structure depicting the village children’s ghostly encounters, and a wall of assorted mirrors. De Souza parallels the displacement of an impoverished squatter community to the exorcisms and evictions of ghosts and demons that the villagers believe share their space. The ruins of gravestones still pepper the landscape of this former graveyard, and the village is a palimpsest where the past co-exists with the present. An overwhelming sensation of the uncanny is generated by this and other works in Dead Ringer, as repressed feelings, objects and transgressions rise up to consciousness and are repeatedly displayed. Brook Andrew’s ‘Possessed’ series are vivid monochromatic prints that challenge perception through the doubling and alternating focal points of the Australian landscape. Steve McQueen CBE adeptly evokes the uncanny in his video installation, ‘Exodus’, which follows two seeming doubles in a crowded street. 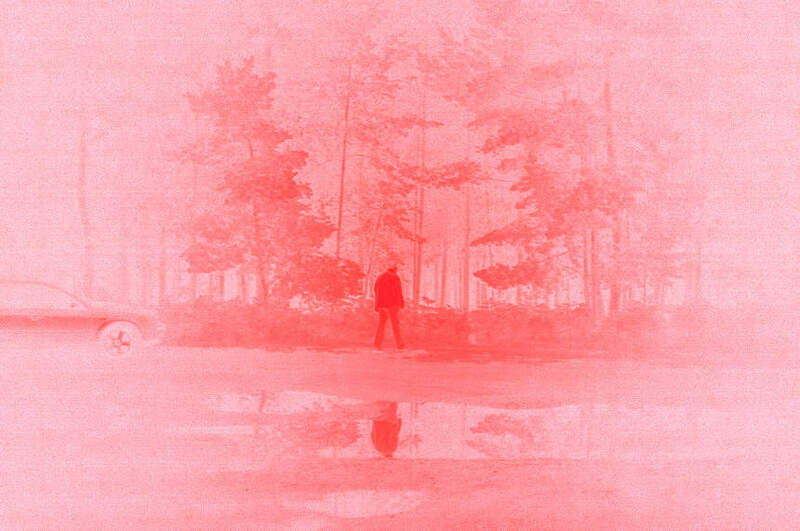 In the ‘Rosa Alba’ series, Leo Maguire captures the unrelenting secrecy of transgressions ‘exposed’ as innocuous in rosy, hazy prints. In a blackbox space, Kynan Tan’s audiovisual installation effectively locates the spectator in large server farms where our online, non-corporeal identities reside. The spectator experiences corporeal dislocation, defamiliarisation and disorientation again and again throughout the exhibition. In ‘Ngarnda (Pain)’, 2011 Western Australian Youth Art Award and Wesfarmers Youth Scholarship recipient Curtis Taylor focuses on a Martu male initiation ritual. The footage is roughly cut, showing close-ups of parts of the subject’s body, thus symbolising the ritual’s physical cutting. Taylor’s blood and sweat fill the frame, and estrange the spectator whose voyeuristic position is further challenged by the aging of the film to allude to ethnographic documentaries of Aboriginal desert communities. The artist’s grandfather sings in accompaniment, emphasising the supportive and formative influence of familial relationships and repertory history in Martu culture. ‘Ngarnda (Pain)’, then, takes on a sublimely beautiful aspect as a powerfully reclaimed representation of identity, community and cultural memory. The impact of the past is alternatively explored in ‘Goldene Bend’er’, a scatological installation by Mikala Dwyer that includes footage of a public, communal defecation ritual. Partially drawing on Sigmund’s Freud’s contention that feces is our first form of currency in negotiating control, Dwyer explicates the relationship between gold and feces. Spectators watched, mesmerized, for the full two-hour duration of the live performance at her Australian Centre for Contemporary Art (ACCA) show in 2013, their pleasurable response perhaps triggered by the externalised manifestation of the structures of shame built around defecation since early childhood. Referring to this unknowable moment of repression, the artist asks, “If you trigger it again, can you re-imagine it?” Indeed, experiencing Goldene Bend’er in the company of others at Dead Ringer was a ritual in itself that sublimated some of the shame that Dwyer refers to. It was uninhibiting. Convivial. Perhaps Megan Cope’s installation proffers the most succinct answer to why we are attracted to what frightens us. The eye of the congregant at ‘Black Mass’ suddenly catches a burst of white light emanating from above. 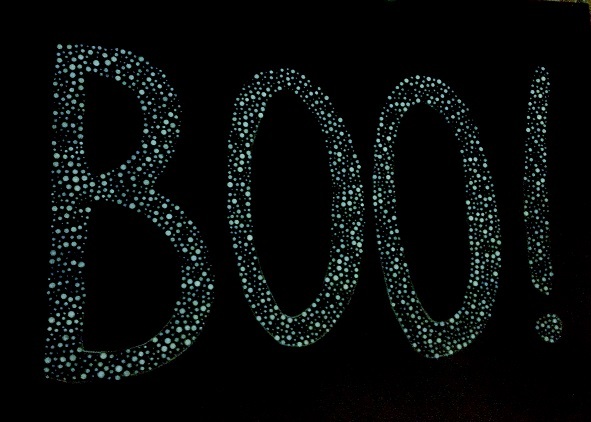 There, in place of an expected symbol of authority, the word BOO – painted in the Aboriginal dot painting style commonly used to obscure secret information – glows and gradually fades until the next flash of light(ning). Cope explains that though historically intended to startle, the word loses its power to instill fear once it is located. Here, the artist symbolically represents how fear of the unknown, like the fear of Aboriginals that historically gripped white settlers, could be overcome by searching for and gaining knowledge of its point of origin. In Cope’s installation, fear itself sheds its mask and – BOO – makes you smile. ‘Art does heal’, an article in the UK Telegraph (http://www.telegraph.co.uk/ news/health/news/11403404/Art-does-heal-scientists-say-appreciating-creative-works-can-fight-off-disease.html) reported in February, specifically with reference to works such as the Sistine Chapel and Schubert’s Ave Maria. Whilst awe-inspiring works possibly boost the immune system, the article also suggested that they might give rise to a withdrawal from others, leading to depression. In contrast, it might just be possible that the ghosts and doppelgangers of Dead Ringer have the opposite effect to works such as those identified by the Telegraph, as they externally locate our internal anxieties and secret transgressions. Having confronted the monster within, the spectator is filled with a paradoxical desire to connect with others. Dead Ringer occasions an aesthetic shock therapy, facilitating opportunities that establish symbolic re-connections with what we’ve lost from our consciousness. I highly recommend a visit – and a repeat. Charmaine Fernandez is a doctoral candidate in the discipline of English and Cultural Studies at the University of Western Australia. Her thesis considers contemporary Singaporean fringe theatre as a vehicle for socio-political activism and expression, focusing on representations of characters neglected or silenced by the State narrative. Her research interests include theatre, film, performance studies, and postcolonial narratives. This entry was posted in Charmaine Fernandez, Dead Ringer, Perth Institute of Contemporary Arts and tagged Angelica Mesiti, Brook Andrew, Curtis Taylor, Keg De Souza, Kynan Tan, Leo Maguire, Lisa Reihana, Megan Cope, Mikala Dwyer, Rachel Dease, Steve McQueen, Stuart Ringholt, Visual Arts by Mark Roberts. Bookmark the permalink.